Level 2 (2 days) prerequisite. 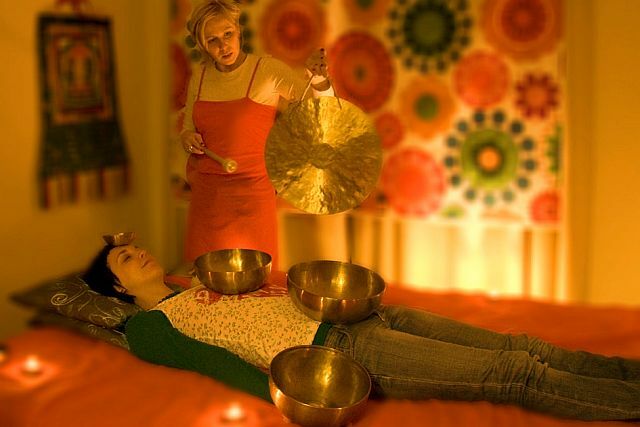 For those who have completed Level 1 and wish to deepen their studies in Sound Therapy, Level 2 is a more intensive weekend workshop covering advanced sound healing techniques using Acama Certificate Tibetan bowl and Gongs. The focus of the Level I training course was on the physical body, during the Level II training course, we will move from working on the body to the bio-energetic field, also referred to as the aura that surrounds our body. You will refine and emphasize your awareness and appreciation of this energy field. You will expand your sensitivity of our body energetics and the effect of sound frequencies and its corresponding vibrations. You will develop your focus on the “power of consciousness”, the mental focus and inner attitude which is the base — the summation and the wholeness — of our method and our actions as a Sound Massage practitioner. The curriculum incorporates the use of therapy “grade” singing bowls and gongs where the student will learn how to work in the human energy field to clean, strengthen and harmonize the subtle body, strengthening health in the holistic sense — as without, so within and vice versa.